Roller furling systems on sailboats offer tremendous advantages while under sail and enhance performance, convenience, and safety. On boats with roller furling, it is important to understand how the on-board roller furling system operates, to learn when and how to deploy the headsails, and what to do if the system malfunctions before setting sail. Without question, modern furling systems make recreational sailing far easier and safer, particularly for single-handed sailors. Furling gear use has increased dramatically over the past 30 years and now is most common on cruising boats but is also utilized on some racing vessels. Roller furling is a method of rolling a sail around a turning pole or an extrusion with grooves for handling lines. Though mainsails can be furled, roller furling is most common on foresails mainly because the equipment makes sail changes, deployment, and stowing much easier, particularly during heavy weather. The sails are always ready for use. 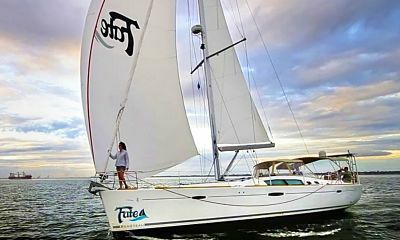 Foresail roller furling can also be operated from the cockpit, which enhances crew safety by reducing or eliminating the need for a crewmember to manually change or reef a foresail. Most furling systems have a plastic pipe, an aluminum extrusion, or a stiffened jibsail, and a spool to hold a furling line. To unfurl the jib, the furling line is released, deploying the sail. When the line is pulled, the sail rolls up on itself for stowage. The leading edge (luff) of the sail is attached to a motor, a hand crank, or a spool with a continuous line and is stiffened in some way to help dissipate the mechanical force of the furler along the sail for smooth operation. Manufacturers have improved furler bearings, fasteners, foils, drums and swivels for reduced effort and longer life, making the gear far more reliable than ever before. For decades, cruising and racing sailboats have carried a mix of headsails (jibs, genoas, etc.) to combine sail types and reefing positions to achieve optimum performance through a range of wind velocities and conditions. To change sails, often on the fly, a crew was required to douse one sail and raise another. Roller furling systems reduced the need to carry a variety of sails and the number of crew needed to change jibsails. Before the development of rolling furlers, a jib was hanked (attached) onto the forestay with shackles running up the sail, allowing a jib or genoa to unfurl and be controlled from the cockpit. The roller furling jib concept was developed in the early 1900s in Britain by a sailor who created a roller device similar to those on window shades. Later, bearings and motors were added and by the late 1940s, rolling furlers had become very popular on cruising yachts in both Britain and around the world. 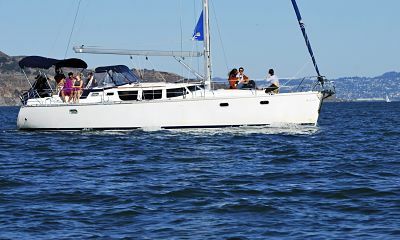 While hanked-on jibs are still used on racing boats that change sails frequently, furling jibs are most common on cruising boats, especially mid-size and larger vessels. As furling units became more advanced, efficiency in varying sea and wind conditions greatly improved. Eventually, aluminum extrusions with grooves were added to accommodate a luff tape sewn into headsails, which made sail changes faster and more efficient. The word “furling” traditionally refers to stowing or dousing (dropping) a sail by flaking (folding), packing (stuffing a sail into sailbag), or using a rolling furler. Generally, furling does not mean dropping or reefing (reducing the sail area), but the use of modern roller furling systems has altered the term's traditional meaning to a degree. Jib “creep out” allows wind to get under the jib leech and tug on the outside layer. This eventually will expose more sailcloth, allowing more wind to get underneath. Innovative designs, combined with decades of on-the-water experience have resulted in rolling furlers that are state of the art, low maintenance, easy to use, and, to an extent, forgiving of human error. The best units rotate freely under load, are durable and easy to inspect and maintain. The most common types of furlers are described briefly below. Head Swivel: A deck-level furling drum, metal forestay extrusion, and a ball bearing head swivel. The sail is fastened to the drum, then fed into a groove in the extrusion and attached to the head swivel, with the halyard fixed to the swivel. Advantages: the most popular and dependable system, provides the best performance and easier headsail changes. Disadvantages: system is expensive. Wire Luff: A removable swivel drum that attaches behind the forestay, a sail without hanks or luff tape, and a head swivel attached to the top of the sail and the halyard. Advantages: low cost and the ability to use other hanked-on headsails. Disadvantages: inability to reef or to furl when the halyard is under full load, and significant headstay sag. Internal Halyard: An extrusion fitting over an existing forestay, with two grooves, one for the jib halyard, and the other for the sail. Advantages: lower cost, reduced head swivel, and the ability to use the halyard for spinnaker raising. Disadvantages: difficulty adjusting halyard tension for sail control, compression on the forestay can make furling difficult in high winds, and sail changes can be challenging. The many moving parts, some not visible, require periodic care. Instructions for maintaining the system should be followed closely, especially corrosion control steps. For a new furling system sail, consider fabric choices and designs and discuss with a sailmaker. Climate and racing or cruising use will dictate fabric and cut options. Whether buying new sails or modifying existing ones, work with a sailmaker to assure proper fit. Sail specifications or modification guides are usually included with a furling system owner's manual. Ensure that roller-furled sails have an Ultraviolet (UV) patch running up the leach, so that the unprotected sail cloth is not exposed to the sun when furled. During winter months, consider removing the jib from the furler and storing in a temperature-controlled space. Also take steps to protect mechanical components. After furling a jib, ensure that the furling line is secured to a cleat to avoid slippage, or put turns around a winch, then to a cleat. A winch drum dissipates the constant strain and shock on the furling line without fraying. When used correctly, roller furling systems can become an integral part of your sailing style.